At over 9,000 feet and 20+ miles into the park, Rainbow Point isn’t nearly as photographed as Bryce Point, but it’s amazing in its own way. From here, you can see the mountains and plateaus of southeastern Utah and southwestern Colorado – perhaps hundreds of miles! Being there, I felt as if I were at the top of the world – maybe not even this world. In “The Voyage of the Dawn Treader” by C.S. Lewis, the heroes – Edwin, Lucy, and Eustace – enter Narnia at Aslan’s Mountain, which overlooks all of the Narnian world. That’s what Rainbow Point made me think of. And because Rainbow Point feels like Aslan’s Mountain, and because it’s more quiet than the chief tourist attraction of Bryce Point, I laid a milkweed seed ball here. Liz would have approved, I think. Kodachrome Basin State Park in Cannonville, Utah, is must see near Bryce Canyon and, at 2,000 ft. (600 m) lower elevation, a warmer place to camp. And for the latter, I was truly grateful to be below the snow line. After all the effort of excavating Kennel from the snowbank, I didn’t have the energy to enjoy Bryce Canyon National Park. I know, I tried. After a late breakfast, the girls and I drove up into the park and to a few viewpoints. They were pretty, but I hardly cared. Forget about getting out of Kennel to walk anywhere. Instead, we drove down the plateau to get a campsite at Kodachrome. Then I didn’t do anything for the rest of the day but sleep and absorb painkillers into my tissues. But this morning, I took the girls on a 3-mile walk from our camp and around the Grand Parade Trail. 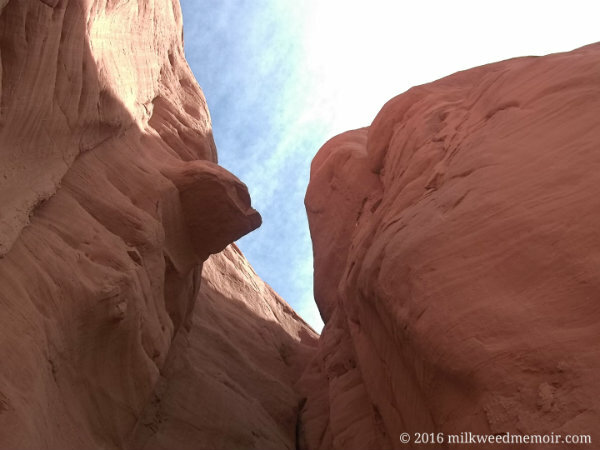 It’s an easy trail, but it meanders along the edge of the Kodachrome Basin, among and through its common features. I was grateful to get a nice, long walk with the girls in the warm sun. It was also fun to explore the slickrock crevices and snap some photos. It made me feel like Ansel Adams. Fun fact: Kodachrome Basin was named such by the National Geographic Society with permission of Kodak. This is according to the park’s newsletter. I’m glad they answered that question. I wondered if the the state of Utah had any risk of trademark infringement. But I guess they don’t. After a snowbound night, Kennel is free thanks to several hours of hard work and the help of a passing Mainer. The challenge was … significant. I awoke at 6:30 a.m., refreshed and ready to rumble. The spirit of Joshua Slocum inspired me, and I set to work. Last night, it got close to 20° F (-7° C), which I hoped had frozen the melt under the front tires enough to let me slowly rock backwards out of the holes. No such luck. So I drank some coffee, took my morning “constitutional,” ate two cheese sticks, and contemplated physics. It occurred to me that the solid ice behind the tires was acting as a brake. It wasn’t enough to move the snow. If I could remove the ice to a level lower than the holes, perhaps gravity would help me back up? So I took a mallet and makeshift chisel (screwdriver) and lay down on my side to chip away the ice like a 19th century miner. I did this for all the tires, front and back, and used my small pickax to excavate more rock-like snow from under kennel. My expectations were high as I set Kennel into reverse and tried to slowly back out. No luck, not enough traction. About then, Spenser, a Mainer who’d camped nearby, offered help. We tried adding his push to Kennel’s work, but nothing, no traction. We dug out more snow from under the van. Still no dice. Spenser, who knows from snow, was puzzled. Honestly, I liked that. It made me feel less stupid. Spenser suggested his tire chains. It took us about an hour, what with mounting chains, pushing Kennel, putting floor mats under the tires, turning wheels left and right, and digging out yet more snow. But finally – FINALLY! – Kennel rolled backwards to freedom. All in all, it took me 3-4 hours of hard labor to get Kennel UN-snowbound. If you add Spenser’s contribution, 4-5 man hours total. After a celebratory chat, Spenser resumed his own adventures. 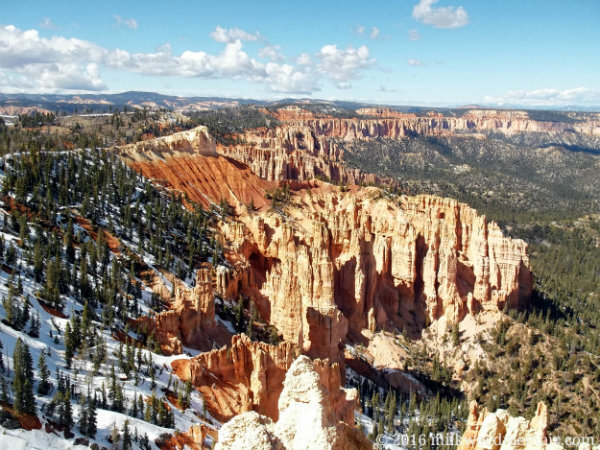 I headed into Bryce Canyon City for a big, hot brunch and LOTS of coffee. “Life Elevated,” huh, Utah? About now, I’m ready for low altitudes, heat shimmers on the road, and palm trees. All one’s childlike love of snow gets shot to hell when one’s van gets stuck in the stuff. I’m staying put for the night. But how will I get out? And how did I get into this predicament? It all started innocently enough. After heading out from Coral Pink Sand Dunes State Park, I headed north on US 89 toward Bryce Canyon. After turning east on Utah 12 and passing through Red Canyon, I finally got to Bryce Canyon City, just outside the National Park. As it was already 3 p.m., I decided to find a camp for the night and visit the park tomorrow. On one of my favorite sites, Freecampsites.net, I found a likely option, the Coyote Hollow Equestrian Camp, just a little west of Bryce Canyon City. As I exited Utah 12 onto the dry, gravel road toward the camp, all looked promising. I could see it off in the distance, across a lovely open field and just into the pines. And Kennel slammed to a stop. I tried to drive out but only spun the tires. After digging out snow, putting down gravel, and generally getting cold and wet, I was still stuck. 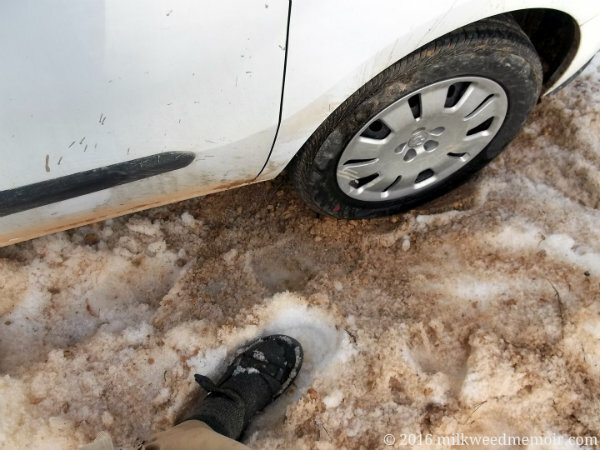 In exasperation, I’d melted the ice under the tires. I was going nowhere. It was about 4:30 p.m. So, I’m waiting until morning for the melt to refreeze and give me get some traction. The worst part (besides my utter humiliation)? I had to put on socks. Is it Christmas? 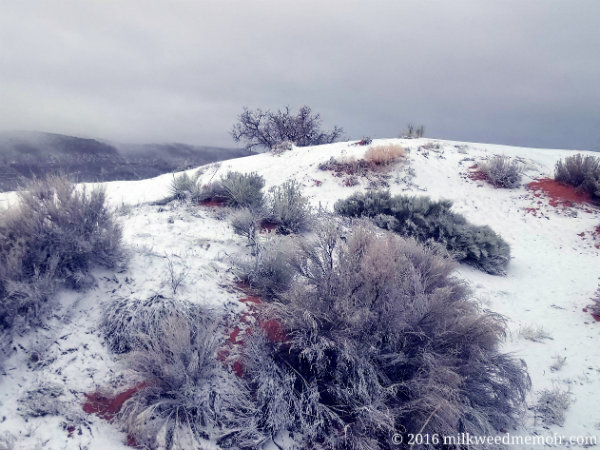 I felt like it when a brief snowstorm frosted Coral Pink Sand Dunes State Park near Kanab, Utah. And the snow came with benefits! Coral Pink Sand Dunes is a popular park for folks to drive their noisy dune buggies and other OHVs. On this particular weekend, even though it was early in the season, the campground was full of riders doing their thang. If you know me, you know I hate full campgrounds and anywhere there’s lots of people. Especially when they have loud, obnoxious hobbies. Then the storm came. At first, it was just rain on Saturday night, March 5, continuing off and on through Sunday. That drove off the dune buggy people. I was ecstatic. The girls and I cuddled in Kennel, staying dry and warm. I finished reading the hilarious "Lamb: The Gospel According to Biff, Christ's Childhood Pal " by Christopher Moore. But then, about 6 p.m. Sunday, March 6, I looked outside. The rainstorm hand become a snowstorm! Snow! SNOW! I hopped out the van like Jiminy Cricket and ran around in my shorts and Tevas snapping photos as the little puffs came drifting down. Christmas, indeed! You see, I’m from South Texas. The last time it snowed there was 2004, on Christmas Eve, and that was the first time in a century. Literally. So snowy weather is still a treat for me, not a pain to shovel and drive through. It was darned pretty too. So sue me. 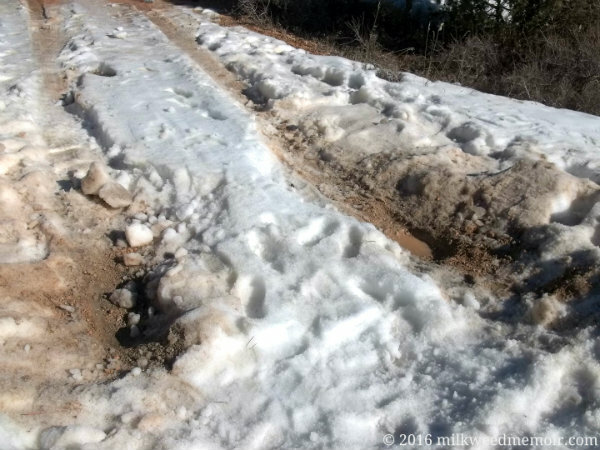 Alas, the ground was warm enough that most of the snow had melted by 9 a.m. Monday morning. But I was there at ground zero! I’m a happy, happy boy!